Bruxism – do you grind or clench your teeth? Do You Hold Stress In Your Jaw and Face? 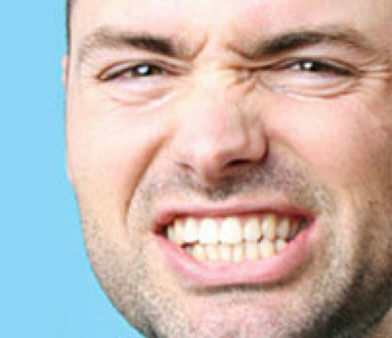 Bruxism has been defined as a “habitual clenching and grinding of the teeth”. Bruxism can also just refer to just grinding with clenching as separate condition. We will refer to them separately here. Both occur most frequently at night time but may occur during the day and are usually involuntary. Both are experienced in both the adult and child population. Unfortunately, many people do not realise they clench their teeth until painful symptoms begin to manifest. Previous research findings point to the possibility of a link between clenching and grinding and an individual’s work environment, especially the coping strategies for work related demands that cause stress. A change in the way your teeth are meeting (your occlusion) may stimulate a clenching response. Clenching may also be as a result of trauma to the neck or jaw (TMJ) or from a filling that is too high, causing the teeth to meet differently and clenching to occur as a way of adjusting. Sleep disturbances such as snoring and obstructive sleep apnoea, which cause stress responses while asleep. Both snoring and obstructive sleep apnoea are a result of a narrowing of the airway while in a lying down position and may stimulate a bruxing response. Sleep apnoea is a condition resulting in a period of not breathing followed by a gasping for air and can become a life threatening condition when severe, making it doubly important to seek help for the condition. Many people may think of teeth clenching or grinding as harmless, but in reality, both can have a significant impact on your health. Stress and tension develop in the muscles of the face and jaw creating spasm, pain and inflammation. Tension in the muscles create painful ‘trigger points’ that can refer pain to other structures like the teeth, gums, ear, head and face – making your presentation confusing. The jaw joint (TMJ) and joint structures may become strained due to the excessive compressive forces of the bruxing / clenching leading to jaw pain and dysfunction. Teeth surfaces may become subject to wear and tear. Your dentist will usually tell you that you are grinding down your teeth. If you suspect you may be clenching or grinding or suffer the above mentioned symptoms then please don’t delay. Call us on 03 9824 8868 TODAY for an appointment. If you are looking for a way to stop your teeth clenching, Melbourne TMJ & Facial Pain Centre can assist with our tailored treatment programs. Treatment for clenching will often depend on the underlying cause. A professional assessment is necessary to establish cause and plan a treatment and management strategy. Whether your clenching is caused by postural issues, stress, trauma or other causes, Melbourne TMJ & Facial Pain Centre can help, with over 24 years of clinical experience in treating clenching and related conditions. Those looking for a solution to their harmful teeth clenching can visit our Armadale clinic or call us today on 03 9824 8868 to set up an Assessment Consultation.